Osteoporotic fractures are a health challenge, especially in developed countries. Initial treatment could only reduce the rate of bone loss. With the introduction of the bisphospho-nates it became possible to increase bone mineral density with medical treatment. Alendronate is the prototype drug for this treatment. Side effects include a peculiar type of osteonecrosis of the mandible after dental work, and a number of authors have reported a peculiar type of femur fracture that was attributed to this drug. Delayed fracture healing is also well known. This adverse effect lasts many years after the drug has been stopped. The administration of bisphosphonates is only recommended once union has taken place. When another fracture happens it may be problematic. In this article the authors followed 7 808 subjects with osteoporosis treated with denosumab. This is a drug adhered to IgG antibody and which inhibits the RANKL receptor. It inhibits osteoclasts. It is given every 6 months as a subcutaneous injection and the effect is fully reversible shortly after discontinuation. Of the patients treated with denosumab, 303 patients had 386 fractures and of those treated with placebo, 364 patients had 465 fractures. The total number of patients observed was 3 902 in the denosumab group and 3 906 in the placebo group. Delayed healing was seen in two patients in the denosumab group, even if the drug was administered close to the fracture time. In the placebo group there were five delayed unions. The majority of the fractures treated surgically were wrist, hip and humerus fractures. Of note was that denosumab treatment was not stopped if a fracture occurred during treatment. Fracture healing time was not impaired and fracture healing complications attributed to denosumab did not occur. The authors conclude that denosumab is a safe drug, the effect of which is easily reversible, and which is effective in the treatment of osteoporosis. Orthopaedic surgeons often see patients with previously undiagnosed osteoporosis, and they can play a vital role in the institution of medical treatment for this condition. This appears to be a promising drug in the fight against common diseases in the elderly. The article sets out to try and ascertain whether the Gould modification of the original Brostrom repair really improves the initial stability of the ankle. Long-term results of the two appear to be equal, according to a number of other papers. The suggestion is that the Gould repair makes the initial repair stronger and, therefore, early break down of the repair is less likely. This is a cadaver study with the strength of the repair checked with a stress device and it was found that there was no significant difference between the two procedures. The message is that it is probably not necessary to do the Gould repair unless the tissues for the Brostrom are virtually absent or appear to be very thin and weak, but in the average case this is an unnecessary additional procedure. Persistent crouch gait is a common and complex problem especially in adolescents and young adults with cerebral palsy. Aetiological factors vary and include hamstring and/ or psoas tightness due to spasticity or contractures, lever arm dysfunction, weakness or more commonly a combination of these factors. The loss of an adequate plantar flexion/knee extension couple will keep the ground reaction force behind the knee joint and in front of the hip and ankle joint, thus causing progressive knee flexion, hip flexion and ankle dorsiflexion. Patella alta and patella tendon elongation develop secondary to this and become contributing factors. Increased patellofemoral compressive forces and/or eventual patellar pole or tibia tubercle fractures frequently occur. Often knee and back pain limit these children's walking capabilities. Traditional surgical procedures address the muscle tightness component but fail to address fixed knee flexion contractures or quadriceps insufficiency, leading to a high rate of recurrent knee flexion contractures. As most of these patients have had previous interventions by the time they reach adolescence (usually muscle lengthening procedures), other methods of treatment should be considered. This Therapeutic Level III study evaluated the effectiveness of distal femoral extension osteotomy and/or patella tendon advancement in the treatment of crouch gait in patients with cerebral palsy. Parameters used were: Pre- and post-operative gait laboratory findings, radiographic evaluation of patella height, strength and functional measurements. Concurrent surgery as part of single-event multi-level surgery was common and a large group of patients had had previous 'traditional' surgical treatment for muscle-tightness components. • All three groups showed an improved knee position in all aspects of the gait cycle. • Gait pathology improved in the osteotomy and the osteotomy combined with a patellar advancement group. Improvement in function as indicated by healing stress fractures and maintenance or improvement in walking function and basic mobility was also noted in these groups. • Resolution of crouch gait occurred in the group that had patellar advancement as part of the procedure, but NOT in the osteotomy only group. • The groups with patellar advancement as a common denominator showed much greater improvement. • Improved in all three groups. The total complication rate in the distal femoral osteotomy group was 19% and in the patella advancement group was 18%. There were no complications in 78% of the patients in the study. 1. Persistent knee pain and not fixation failure was the most frequent complication. Four patients (from the combined procedure and patellar advancement group) had persistent pain, but the pain resolved in three of the four patients within two years of surgery. 2. Three patients who received femoral extension osteotomies had neurovascular compromise (sciatic nerve stretch palsy). Both articles include various 'tips and tricks' to avoid this serious complication. 3. Hyperextension (overcorrection) deformities and fixation failure were extremely uncommon. Due to the fact that the rates of complications were traditionally high with these procedures, the excellent follow-up article on the proper surgical technique should be read in conjunction with the outcome study. The implication for surgical decision-making is clear: Inclusion of patellar tendon advancement is necessary to achieve optimal results in the surgical management of a persistent crouch gait exhibited by adolescents and young adults with cerebral palsy. When this procedure is done alone or in combination with a distal femoral extension osteotomy (for the treatment of a knee flexion contracture), knee function in gait can be restored to values within typical limits, with gains in community function. Since visiting the Gillette Centre for Gait and Motion Analysis (St Paul, Minnesota), this treatment approach was adapted by our institution with comparable results. Careful and meticulous attention to the prescribed surgical technique is essential to avoid complications. The authors' premise for developing this study was their impression that hallux valgus (HV) in males has an earlier onset, presents more severely and would be more difficult to treat surgically than in females. In the first part of this article, the results of a retrospective clinical and radiological analysis in a series of 31 male patients with HV is presented. During 1985 to 2005, 865 surgical procedures for HV correction were performed. Thirty-one patients (53 feet) were male. Their mean age was 40.4 years, and in 22 patients the deformity was bilateral. Appropriately matched female patients were used for comparison. 1. The proportion of symptomatic HV was 15 women for every man. There was a much lower incidence of HV in males than earlier studies suggested (8.1 ~ 9.1). 3. There was a much earlier onset of the deformities and symptoms in the male group - predominantly the 'juvenile' type. 4. Most male patients (71%) presented with bilateral deformities. 5. The HV angle, distal metatarsal articular angle (DMAA) and tarsal metatarsal angle were all significantly higher among males. 6. The hallux valgus interphalangeal (HVI) angle was significantly higher in females. 7. There was a significant predominance of congruent metatarsophalangeal (MTP) joints among males, while among women there was predominance of incongruent joints. 8. No statistical significant difference in sesamoid subluxation and flat feet between the two genders was found. 9. HV presents as a more severe deformity among males. 10. Hallux valgus occur more due to intrinsic factors within the male group. The authors conclude that the DMAA is the main intrinsic factor that differentiates the HV deformity in males and females. The second part of the article uses the same cohort of patients to assess the results of surgical treatment. Of the 31 male patients (53 feet), three patients were lost to follow-up, thus limiting the study to 50 feet. The authors claim that despite the small number, it still constitutes the largest known male hallux valgus cohort with the longest follow-up (mean follow-up 10 years) yet reported. The AOFAS hallux scale was used. The surgical indications were based on the severity of the angular radiographic findings, congruency of the MTP articulation and increased DMAA (a new algorithm was adopted). The following procedures were used (a brief description is given in the article): Distal chevron osteotomy, biplanar chevron osteotomy, Mitchell's osteotomy, Proximal opening-wedge osteotomy and scarf osteotomy. No lateral distal soft tissue release was used in this series. Substantial improvement between the pre-operative and post-operative angular measurements was found. The post-operative HV angle was improved to 2 points (I assume by 'points', they mean 'degrees'*) above the normal limit. Surprisingly, the HVI angle and proximal articular angle of the proximal phalanx increased post-operatively (perhaps due to derotation of the hallux as a result of the surgery). Post-operative analysis was performed through the comparison of the 'relative' corrective capacity of each one of the techniques employed. As expected, the best scores were in the treatment of milder cases. The results showed that it is possible to achieve adequate sesamoid correction without a lateral release. The Scarf technique was clearly inferior (and should be used in cases milder than those recommended in the literature). Scarf and proximal osteotomy alone were able to correct only 17% of the altered DMAA (compared to 43% of the other techniques), which is characteristically high in men with HV. The emphasis is on the importance of extra articular osteotomies that will correct the DMAA without compromising the congruency of the MTP joint. The complication rate was relatively low (10%-1% healing of the osteotomy site and 6% skin healing) when taking into account the 80% incidence of moderate and severe deformities in this study (no recurrences and no overcorrection!*). In summary, these two papers provide the reader with an awareness of the male hallux valgus deformity. They provide significant differences in the aetiology, demographics and presentation between male and female hallux valgus and potential pitfalls in the operative management. Normal reference values and detailed radiographs with all important angles are provided. Furthermore, a new algorithm, to the one of Mann & Couglhin's, that considers the distal metatarsal articular angle, was developed, keeping up with the evolution of the surgical techniques. They also established that it is not more difficult to correct the deformities of hallux valgus in males when compared to females. They also conclude that the defining characteristic of this deformity in the male is an increase in the distal metatarsal articular angle. A weakness of this study was the relatively small cohort of male patients (the study spanned two decades). There is no mention of the female hallux valgus surgical outcome. This is a new imaging modality which combines highly detailed CT with the functional information from a triple-phase radionuclide bone scan. 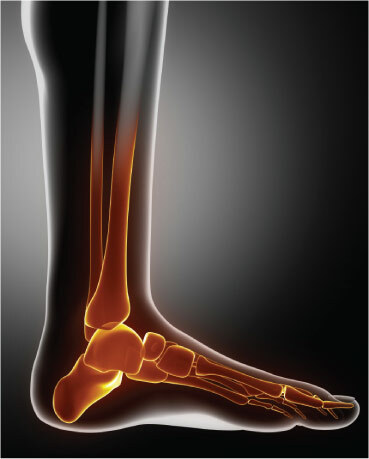 The aim of this retrospective study was to evaluate whether bone scans with SPECT-CT provided a useful contribution to the management of patients with foot and ankle pain, and whether its results changed the clinical management. The study included 50 patients (35 females and 15 males) with various complex foot and ankle problems with diagnostic uncertainty after thorough clinical and radiological examination. All patients had a pre-interventional SPECT-CT. Pathology as identified by the SPECT-CT was taken as the final diagnosis, and management was based on this diagnosis. 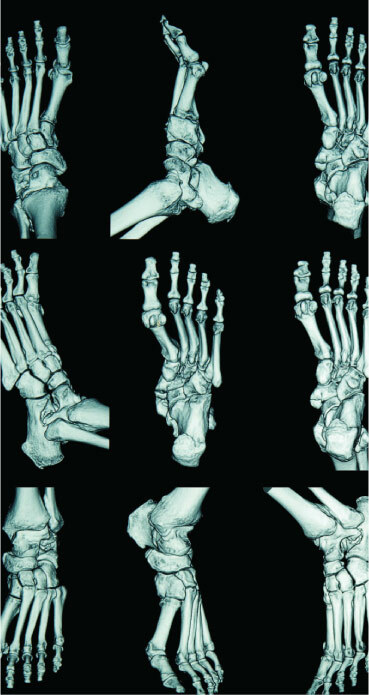 In 78% of cases the SPECT-CT did not match the provisional diagnosis; in most cases this was due to inaccuracy in identifying the precise midfoot joint involved in cases of osteoarthritis. Overall 92% of patients' symptoms improved after intervention based on the SPECT-CT findings. This is the first study to evaluate the accuracy, sensitivity and specificity of SPECT-CT in foot and ankle pathologies. The study has limited numbers but clearly demonstrates the value of the SPECT-CT in diagnosing foot and ankle pathology. This imaging modality shows great promise in localising the specific joint causing pain, especially in the complex midfoot region.